This is only the third book I’ve read by D E Stevenson, but I’m finding that her novels are perfect when I’m in the mood for something gentle and undemanding, but still with convincing characters, some insights into human nature and just enough plot to keep me interested from beginning to end. Having read what other people have to say about her books it seems that they vary in quality, but I think I’ve been lucky with the three I’ve chosen to read so far (Miss Buncle’s Book, Amberwell and now this one). Vittoria Cottage is the first in a trilogy. The ‘cottage’ of the title is located in the quiet English village of Ashbridge and is home to the Dering family. Arnold Dering died before the novel opens, leaving behind his widow Caroline and their two daughters (there’s also a son who is with the army in Malaya). The younger daughter, Bobbie, doesn’t give Caroline any problems – at least not during the course of this first novel – but the same can’t be said about pretty, selfish Leda. Her engagement to law student Derek causes concern for both families, who can see that the young couple will have no money and are perhaps not very well suited anyway. However, Caroline and Derek’s father resist the temptation to interfere too much and leave Derek and Leda to learn this the hard way. Meanwhile, Caroline has a romantic interest of her own, although she tries to deny even to herself that she is falling in love. He is a newcomer to the village – Robert Shepperton, a man with a mysterious past. What did he do during the war? What happened to his family? And why has he come to Ashbridge? When Caroline’s sister Harriet, a London actress, arrives for a long stay at Vittoria Cottage, she also finds herself drawn to Robert. But which sister, if either, is Robert interested in? The main characters in the novel are well drawn and engaging (apart from one or two, such as Bobbie, who remain a bit shadowy) and I liked Caroline immediately. As an older, more mature heroine, she is sensible and practical and if she can sometimes be frustratingly naive and lacking in self-confidence, it only makes her all the more human. I enjoyed watching her relationship with Robert Shepperton slowly develop – a relationship built around friendship and trust. I also liked Caroline’s maid, Comfort Podbury, a young woman who has gained a lot of weight due to a medical condition and is devoted to Caroline because she is one of the few people in Ashbridge who doesn’t judge her by her size. Vittoria Cottage was published in 1949 and the effects of the war on Caroline and her friends are clear – rationing is still in place, the Derings wonder where Mr Shepperton gets enough coupons to buy so many new clothes, and Caroline is surprised when she finds herself in trouble for attempting to send eggs to Harriet in London. If I’m going to be critical, I could say that this book doesn’t feel very original and I can think of quite a few other novels I’ve read by similar authors which have similar settings and similar types of characters. I don’t think that matters too much, though, because DE Stevenson is very good at writing novels like this and, as I said at the start of this post, sometimes they are just what I’m in the right mood for. 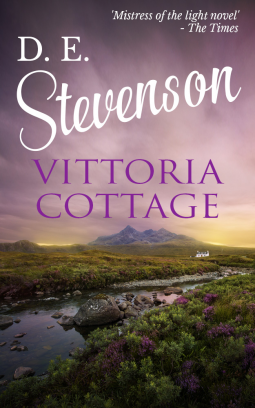 I didn’t enjoy Vittoria Cottage as much as the last Stevenson book I read, Amberwell, but I did like it. The ending seems very abrupt and, without saying too much about it, it’s satisfying in some ways but in others not very satisfying at all! If I want to know what happens next to the Dering family, I’ll have to read the other two in the trilogy, Music in the Hills and Shoulder the Sky. I read this one, too, but I didn’t know it was part of a trilogy. Maybe I’ll look the next one up. I’ll have to remember to look for the next book. I often seem to read the first one in a trilogy and then never get round to reading the others. I didn’t even know it was in a trilogy, so I definitely would have missed the others. I enjoyed Miss Buncle’s Book but haven’t read Miss Buncle Married yet, so I’m glad to hear you loved both! I think Amberwell is my favourite of the Stevenson books I’ve read so far. I must read Summerhills soon! This does sound very engaging. To date I have only read the Miss Buncle books including the Four Graces which isn’t really a Miss Buncle book but is set in the same place – and one other book Celia’s House which is good too. I think you might enjoy this one. I have only read the first Miss Buncle book so far but I do still want to read the others. Oh, I’ve just read the Miss Buncle stories and just recently, Mrs Tim of the Regiment. I will look out for this trilogy, too! I would definitely recommend both this book and Amberwell – I enjoyed them even more than Miss Buncle. I’m already interested in reading the Mrs Tim books, so I’m pleased to hear you think so highly of them. I’ll look forward to getting to know Hester Christie – I love the quote you’ve included here!